A single charge and sync solution for all your devices. Do you have multiple digital devices such as iPhone., iPod., Blackberry. or Sony PSP. for example, but are feed up with hunting for the USB cables, or having to purchase the manufacturers expensive 'device specific' versions? The new C-USB-MULTI from LMS Data is your ideal solution for users with a myriad of digital devices, phones, smartphones, tablets, MP4 players and game consoles and the like, which all use there own specific charge/sync connector. 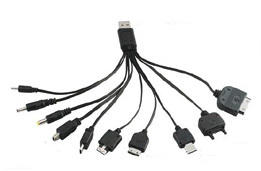 The C-USB-MULTI features 10 different connectors as used on almost 90% of the world's devices, all of which are connected via a generous but compact ribbon cable to a standard USB connector, so you can plug into your Windows, MAC or Linux Computer and charge and sync. need for more than one USB port on your computer. companion for your digital lifestyle!